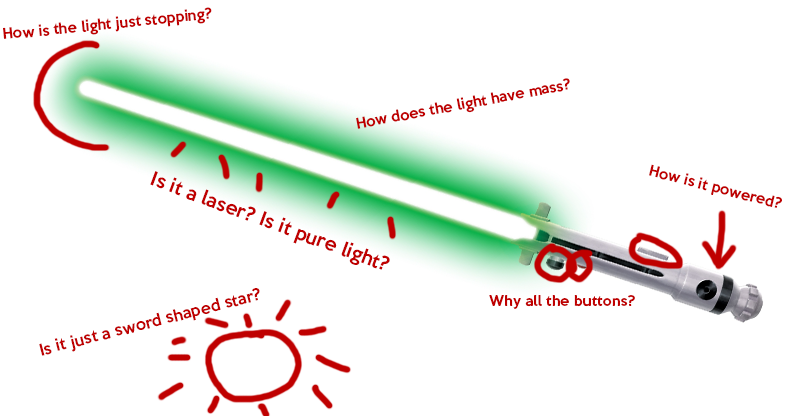 Science Explains: Can LightSabers Exist? Design for Ahsoka Tano’s lightsaber is credited to Disney. The only thing in this picture I own are the scribbles i made in PS. Ever since A New Hope hit theaters 39 years ago, nerds have begged the scientific community for a real-life version of the coveted lightsaber. Over the past decades, many attempts at creating a real lightsaber have been made. The closest we’ve come are lasers and stylized flamethrowers. Harvard-MIT laboratories even managed to get photons to interact, creating photon molecules (light with mass! Lightsabers are light with mass!) back in 2013. There are many resources which could create a lightsaber, but there is only one resource which could recreate a lightsaber identical to the movies. Any sword made of any substance other than plasma is not a lightsaber. Plasma is commonly reffered to as the fourth state of matter, aside from solid liquid and gaseous. Its a form of ionized gas made up of free floating electrons. In real life, plasma is used in neon signs, TVs and flourescent lights, because of how easy it is to be colored by light passing through it. Plasma is extremely common in the real world. How common is it? Well our sun is made of plasma. Its literally a giant ball of plasma gas. Plasma is also highly toxic, and flammable. If you can’t stab your enemies with plasma, the poisoning from the gas sure will. If the resource is so abundant and effective against humans, why aren’t we using it with cool things like a lightsaber? Plasma does not have the properties of a solid object, and cannot be controlled like a lightsaber. At the time of this writing, there is no possible way to give plasma a physical form. In order to direct plasma in a straight line, two end points are needed. It is perfectly possible to direct plasma, even in the shape of a lightsaber. This doesn’t matter however, when the plasma which actually makes a lightsaber is completely encased in electromagnets. In order for a sword made of real world plasma to be made, it would require a cap on the end of the blade which would direct and shape the plasma. Even if I didn’t go into the details of how a cap would be held up (metal rod, electromagnets connected to the system, etc) it is no longer a lightsaber. By being forced to add a cap onto the lightsaber, the saber’s stabbing capabilities are lost, a function which is often used in star wars. Sure a sharp point can be put on the cap, but it won’t have the same effectiveness of a lightsaber. A lightsaber can easily cut through several feet of steel easily, whereas a metal point would just bounce off. If I put a cap on the lightsaber, I’ve stopped making a lightsaber, and started making a beam katana straight out of No More Heroes, which would A) be ironic since the beam katanas were inspired by lightsabers and B) be made from a laser beam and not plasma, which is straying even farther from what is trying to be made. Another issue with using plasma, is plasma is a gaseous substance, and will diffuse into the air the second it hits air. In the many videos found on the internet of machines manipulating plasma, the plasma is in a vacuum where it can flow freely. When plasma is exposed to air, it will begin to diffuse because there is suddenly so much pressure for the gas to go in countless different directions. Even if I made a lightsaber whose blade was a rod which shot out of the hilt and shot out plasma, the blade won’t be effective in cutting at all. Its still a gaseous material, it doesn’t have the properties of a solid so the gas will just pass around whatever it hits, and where does the endless supply of plasma come from!? At best, because plasma burns skin on contact, the best result will be burning someone. But what about Plasma Cutters? Plasma cutters are jets of hot plasma which are used to cut conductive materials such as steel, aluminum, and copper. Wow just like that I’ve debunked this whole article huh? Wrong. With our current technology, a plasma cutter has to be connected to a large source of electricity at all times, and not even the strongest plasma cutters in the world could create a beam large enough to compare in size to a lightsaber, as well as have the power of one. The strongest plasma cutters in existence now weigh thousands of pounds, and can only make a beam which shoots out a distance of millimeters, and a width a hundredth of a centimeter. The reason the plasma cutters are able to cut so well is because the plasma is superheated. When superheated, plasma acts more like a flame being shot out of the cutter. Superheated plasma takes a TON of energy to create. This makes a portable energy source which could superheat plasma a longshot with current technology. A) Even if a plasma cutter could be turned into a lightsaber of sorts, it still wouldn’t work like a lightsaber. A plasma cutter lightsaber would just be a jet of fire, not a solid blade. You wouldn’t be able to have lightsaber duels! The plasma jets would just pass through each other! Because of this, lightsaber battles would lose parrying, which is both important to swordplay, and the coolest part of a lightsaber duel. B) In Star Wars the Old Republic history, the first lightsabers, called protosabers, were powered by giant battery packs worn by the user, which would connect to the sword’s hilt by a thick wire. This means in theory, a future jedi could exist with a lightsaber, albeit a saber whose movement is limited by a battery pack which would be a limited power supply. You could make a lightsaber with a power source out of a plasma cutter, but it wouldn’t be a lightsaber without the plasma having the properties of a solid object. Lightsabers as they are known in the films are powered by a stone called Kyber crystals. In the interest of your own sanity over the lack of information on the crystals themselves (insert mumbo jumbo explaining kyber crystals are made from the force) we’ll just say Kyber crystals are in theory, an endless source of plasma energy. Unless we discovered a source of UNLIMITED POWER (yes I went there) like a kyber crystal, there is no way to power a lightsaber in the way the movies do. Kyber Crystals are the key to creating a real lightsaber, and we don’t even know if something like a Kyber crystal exists. There’s the easiest way of explaining plasma’s applications in lightsaber technology! As I previously mentioned, researchers have found ways to make physical light, but only at the atomic level which means we wont see photon blades very soon. Even then, it would be a blade of pure light which would just blind you, and even then it would be TOO effective. It wouldn’t be a Star Wars lightsaber. It would just be a sword which can cut through pretty much anything. For the sake of this article, I made sure to be accurate to what a lightsaber in Star Wars is. If there’s anything I left out (I finished writing this after going 25 hours without sleep, I could’ve forgotten something I knew already, gimme a break) please don’t hesitate to tell me! Science Explains is a series where I explain nerdy phenomena to you through SCIENCE. Like the series? Got a question about something you saw in a comic book once? Leave a comment and tell me what you want to learn about!